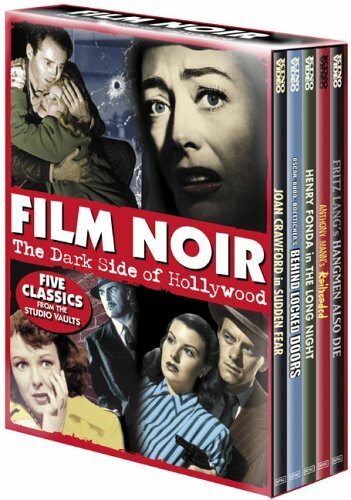 Kino Video has released an excellent new box set packed with five film noir titles from their back catalog. The discs themselves have not changed, but have been re-packaged in new slim cases and priced at a very reasonable $49.95 (retail). The individual titles together would retail for about $150. But the definition of film noir is very loosely applied here, and though the five titles have very little to do with one another, they're each worth a look. The box kicks off with Fritz Lang's Hangmen Also Die (1943). A wartime propaganda piece, it's arguably Lang's least interesting feature (the same applies to Howard Hawks and his Sergeant York) and not a genuine film noir. Lang usually demonstrated an amazing visual economy, but this is his longest American film (134 minutes), and his most overt, though the story was very personal to him. It depicts the eventual downfall of the Nazis and their demonic leader, Reinhard Heydrich (Hans Heinrich von Twardowski), in Czechoslovakia. The legendary playwright Bertolt Brecht co-wrote the screenplay with Lang, though reportedly the two men did not get along and a third writer (John Wexley) was called in to smooth things over. English-speaking actors (Brian Donlevy, Walter Brennan, Anna Lee) awkwardly portray the Czech heroes and the entire thing is obviously shot on sets. Despite all this, the film has some lovely black-and-white cinematography by James Wong Howe. Running only 62 minutes, Budd Boetticher's Behind Locked Doors (1948) is even tighter, though less stylized. A precursor to Samuel Fuller's great Shock Corridor (1964), it tells the story of a reporter (Lucille Bremer) and a detective (Richard Carlson) looking for a missing criminal, who they suspect is hiding in a high security insane asylum. The detective checks himself in to prove he's there, but discovers all kinds of unexpected trouble. Fuller took the material quite a bit farther, but Boetticher (credited here as "Oscar" Boetticher) nonetheless gives his film a tough, terse energy. Tor Johnson, famous for his roles in Ed Wood's films, appears as a criminally insane brute. The Long Night (1947) represents something of a high point in the questionable career of director Anatole Litvak (Sorry, Wrong Number; Anastasia). A remake of Marcel Carne's Le Jour se lève (1939), it tells the story of a war veteran, Joe Adams (Henry Fonda), accused of murder. While he holes up in his apartment, attempting to ward off the police, we see his entire story in flashback -- and the stories of other characters in flashbacks within his flashback. It turns out to be a complex love triangle between Joe, the woman he loves, Jo Ann (Barbara Bel Geddes) and a sleazy nightclub magician (Vincent Price). Litvak clearly unfolds the story and effectively taps into the needy emotional reservoir that drives the story, but the performances are the high point. Fonda gets beyond the distant stiffness he showed in other films, and Bel Geddes has an adorable, wounded quality. The great Elisha Cook Jr. plays a blind man who "witnesses" the murder. Ann Dvorak, Howard Freeman and Queenie Smith co-star. Finally we have David Miller's Sudden Fear (1952), a high-profile vehicle for Joan Crawford that scored her an Oscar nomination. Shot in San Francisco, the film tells the story of a successful playwright (Crawford) and an actor (Jack Palance) who fails to nab a role in her latest production. They meet on the train, fall in love and marry. But things get complicated when another woman (Gloria Grahame) from the actor's past turns up. At 110 minutes, the film is far too long and plays as much as melodrama as it does noir. But all three actors turn in top-notch work and make the film worth a look. In some circles, Sudden Fear is even considered a cult classic. It received four Oscar nominations in all, for Crawford, Palance, Best Cinematography and Best Costume Design. Grahame actually won an Oscar that year, but for another film, The Bad and the Beautiful. DVD Details: Few of these discs come with any extras -- there are no trailers or optional English subtitles -- and the quality varies from scratchy to clean. The Long Night disc comes with an excerpt from Le Jour se lève and a photo gallery.